It's hard to believe, but 2015 is winding down quickly. Even though we are all busy trying to tie up this year with a pretty bow (not to mention get ready for the holidays), it's in our best interest to take a little time and get ready for what the new year can bring to our blog and our business. That's right, it's time to start doing some blog planning. If you are one-woman (or man) business as I am, then you wear all the hats. That means that planning, record-keeping, billing and marketing are all on your list. Not to mention the day-to-day pieces of actually running your business. But if you take a little time right now to set some things up and get organized, you can start 2016 off on the right foot. This is a must for me. Nothing inspires me like a clean calendar. I use a momAgenda (FYI I am an ambassador), and their calendars run from August to August, so I am ready. Now is the time to write in all your 2016 commitments so far . . .you know, like your kid's spring break. Knowing what time you have available to work, can make you more efficient in scheduling upcoming projects, campaigns and client work. The second step is to LOOK at this calendar before you say yes to new things. You don't want to say yes to a campaign that's due while you're on your summer cruise to Greece.Getting in the habit of looking at your calendar before saying yes, can make you have to say no a lot less, not to mention reduce your stress and anxiety. Now is the time to take a look at your 2015 goals. How did you do? I am the first to admit that I am not strong on goal setting. Call it fear of commitment, but I struggle to write them down. They seem either too small or too big, maybe it's a perfectionism thing. But if you have goals for 2015, drag them out. Take a look and see how you did. Have a goal you didn't meet? See where it may fit into your 2016 plan, or let it go. Sometimes we outgrow goals before we reach them. Next start thinking about 2016. Write a few goals down. A long-term and a couple short-term will do the trick. If you want to be efficient, add due dates. Say, June 30th for short-term and December 31 for long-term. I like to add a few steps or small actions I can take to reach my goal, and then check them off as I go along. Do you have clients? What systems do you need to keep up with to make your client work more efficient? Put them in place now, so that on January 4th, you're ready to go. Looking for new clients? Draft your pitch and save it. That will one less thing you have to do in the new year. 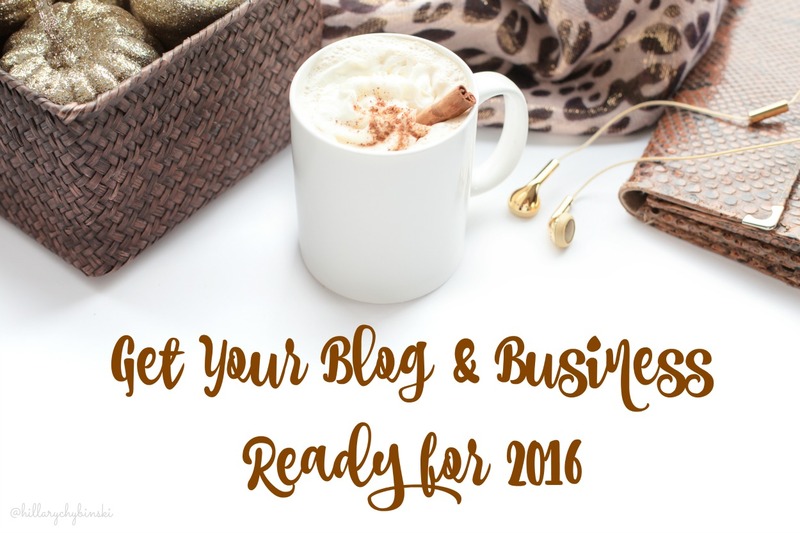 What are you doing to get ready for 2016?